Sick of buying expensive ink cartridges for outrageous prices??? Try our refillable cartridges and never throw another cartridge away. 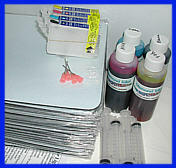 Ten fold savings with our inks. 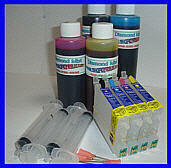 Refillable ink cartridges with Auto Reset chips and 4 oz. of ea. color ink (40 cartridges worth of ink) for only??? for business promotions of friends.